It was just your average the-weekend-is-over Monday when the most fantastic newsletter popped up in our inbox and almost caused us to fall off our chair. For this, folks, is not your average Label Lust - we're coveting every single item from new luxury British dog-wear brand SNOUT & PAWS. We recently visited luxury pet boutique Mungo & Maud in Belgravia - see our Woof Guide write up. While we saw plenty to make our credit card twitch, there were two items that especially caught our eye, the Bauhaus leather collar and lead set, which Basil and I have been coveting ever since. Aptly named after a movement synonymous with style and modern design, this luxury collar and lead set in camomile and slate is for hounds, who like their style simple and timeless. We know it’s still quite a few weeks until Valentine’s Day but we wouldn’t want you to miss out on being able to bestow your furry loved-one with a My Silly Valentine Bow Tie Dog Collar by Silly Buddy. New Buy: Duck Beak Dog Muzzle - it's Quackers! For no other reason that it’s Monday and we don’t especially care for Mondays, we share with you the Oppo Dog Muzzle – a muzzle designed to look like a duck's bill. Nothing says ‘Hello Mr Snowman. Greetings Jack Frost’ like a bright red down dog jacket! Stylish and snug, it’s quite the little number to brave the sudden cold snap. 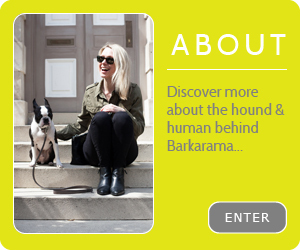 Available in four other colours, the I Love My Dog Coat is priced £89 from yoox.com. We spotted so many great things at the recent Discover Dogs show including Simba Jones’ range of coastal themed dog jackets, inspired by the designer’s childhood on the East coast of Africa and her current location, Aberdovey on the West coast of Wales. The onset of winter does little to make our tail wag. However, the prospect of picking out a new coat to see you through those dark, cold days is an entirely different matter. With so many styles to choose from, it's often difficult to make a decision but we find that you can't go wrong with a classic; enter the Rivington Tweed Dog Coat by Love My Dog.